Get it today and Save! Offer Expires February 28, 2019. Includes State Specific Last Will, Living Will and Power of Attorney PLUS (1) Credit Report Form, (2) Financial Statement, (3) Personal Life Planning Form, (4) Estate Planning Worksheet and (5) Monthly Cash Flow Statement. My Spouse and I have children from this marriage. My Spouse has children from a previous marriage or relationship. I have children from a previous marriage or relationship. Childen are 21 years or age or older. Are any Children under the age of 21? Would you like to include a package for your spouse for only $39.00? Would you like to have your documents reviewed by a legal Professional after your complete them? Review fee is only $50.00. Would you like to have your documents reviewed by a legal Professional after your complete them? Review fee is only $100.00 and you and your Spouse. E-Mail delivery is free. For Hard Copy by regular Mail there is an additional fee of $15.00. 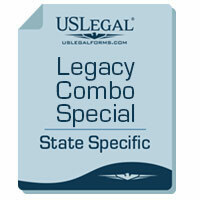 The Legacy Bundle contains essential Estate Planning documents, information on how to organize life documents and other products. The documents in this package are State Specific. 1. Last Will – Complete this form to detail in writing your wishes regarding who is to receive your property at death and who will administer your estate. It also enables you to appoint trustees or guardians, if applicable. 2. General Durable Power of Attorney – This General Durable Power of Attorney is a general, durable power of attorney which is effective IMMEDIATELY. You can use this form to appoint an attorney-in-fact (agent) to make decisions regarding property, financial, banking, management, business and other matters for you. The powers granted to an Agent in this Power of Attorney are very broad, but this Power of Attorney does NOT provide for health care services. This form complies with all applicable state statutory laws. 3. Advanced Health Care Directive – Living will and Health Care Proxy – Statutory Form – This Statutory Living Will form allows you to express your wishes and desires if it is determined that your death will occur whether or not life-sustaining procedures are utilized and where the application of life-sustaining procedures would serve only to artificially prolong the dying process. It is a declaration that such procedures be withheld or withdrawn, and that you be permitted to die naturally with only the administration of medication or the performance of any medical procedure deemed necessary to provide you with comfortable care. 4. Estate Planning Questionnaire and Worksheets – This Estate Planning Questionnaire and Worksheet is for completing information relevant to an estate. It contains questions for personal and financial information. You may use this form for client interviews. It is also ideal for a person to complete to view their overall financial situation for estate planning purposes. 5. Personal Planning Information and Document Inventory Worksheets – This form enables you to document matters relevant to your life and personal planning such as the location of your important legal documents, relatives names, contact information, medical information, financial asset inventory and more. © Copyright 1999-2019 U.S. Legal Forms, Inc.